17 more Chinese stars alleged to have evaded taxes: Who are they? If reports were to be believed, 17 more Chinese stars are under probe for tax evasion. Tremors were felt throughout Chinese showbusiness in October when superstar Fan Bingbing publicly acknowledged and apologised for under-reporting her tax obligations. The highest-earning China celebrity at that point, Fan had to return 883 million yuan (S$176 million) to authorities. Now, a document has emerged on WeChat mentioning 17 artistes who have been contacted by the taxman. 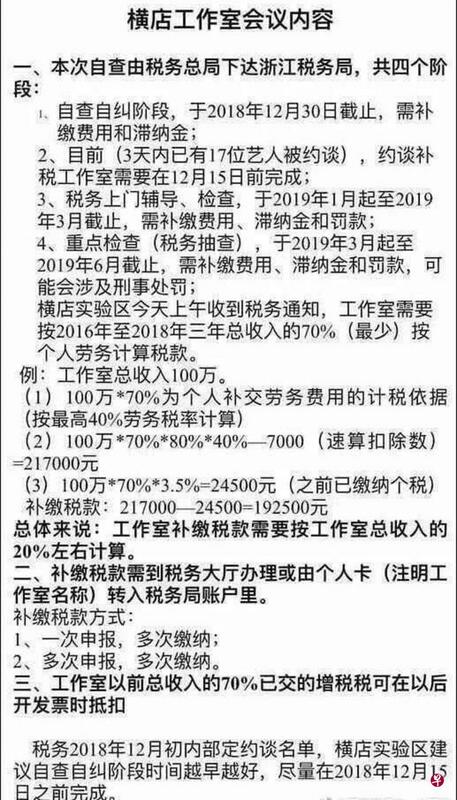 According to the widely-circulated memo, production studios have to re-calculate their taxes between 2016 and 2018, and voluntarily submit due taxes by Dec 15. Action could be taken after March against offenders. Hk01.com also reported that the net has widened. Where previously only studios making 5 million yuan were investigated, this bar has been lowered to 200,000 yuan. The buzz now is over the identities of the 17. They are believed to include A-list actors and popular young stars, according to Sina, and one male artiste even broke down during his meeting with authorities. In total, 551 artistes, directors, producers, screenwriters and others across the industry have been targeted, reported multiple media outlets. Who are among the 17 named by the media and insiders so far? Click through the gallery to find out. Who are the alleged 17 China stars to have evaded taxes? Deng Chao owes 250 million yuan together with wife Sun Li, according to Hk01.com. Sun Li, who went from Singapore's Star Search to China's biggest television actress, is allegedly under probe together with husband Deng Chao. Huang Xiaoming owes 600 million yuan, according to New Tang Dynasty Television. Huang Xiaoming's wife Angelababy is allegedly under probe too. Wu Jing owes 200 million yuan, according to a Weibo user reported by CB.com.cn. Xu Zheng, Best Actor at the recent Golden Horse Awards.